James Joseph Colgan was born January 5, 1871, in Loughtown, County Kildare, to Patrick Colgan, a gentleman farmer, and Letitia Cleary. Other children in the family were Laurence Joseph (1858), Ellen Mary (1861), Letitia Joanna (1863), Catherine (1865), Walter Joseph (1866), Mary Elizabeth (1867), Joseph Ignatius (1872), Lucy Mary (1873), and John William (1876). The head of the family, Patrick, died March 25, 1887, of complications from diabetes. Letitia died August 8, 1895. When James was naturalized, he said that he arrived in the United States in August of 1889. He might be the James Colgan arriving at New York aboard the SS Etruria on August 12, 1889. If so, he embarked at Queenstown carrying one piece of luggage, and said that he was from County Dublin. 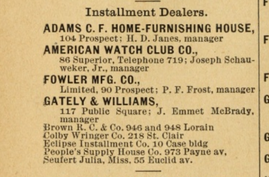 He first shows up in Cleveland in the 1891/1892 City Directory as joint proprietor of the People's House and Supply Company, an "installment dealer" located at 973 Payne. I imagine that installment dealers were businesses that sold items on the installment plan, but I'm not sure. James next tried his hand at running a saloon, first at 200 Erie, then at 542 Union. After that, he settled into the field of sales, being called an agent, salesman, furniture agent, and commercial traveler on various records. On January 15, 1895, James Colgan married Mariam Murphy at Immaculate Conception Church on Superior Avenue. They had one son, Walter, born February 18, 1904, who died of epilepsy at the age of 13. Somewhere along the line James developed a problem with alcohol, it and might be reflected in his stated residences on the records. While he and his family were at 167 (now 723) Prospect from 1899 until 1906, after that things look shakier. James is listed at The Frontenac in 1906, then on Neal Terrace in 1908. On the 1910 census, the family is at 8807 Superior. When Walter died in 1917, Mary was at 1325 East 92nd, but James was at 115 Lakeside. In 1918, Mary is again at 1325 East 92nd, but called the "widow of James." James still had 5 years to live. On April 19, 1923, James Colgan was found dead at 1000 Hamilton, his residence was 9000 Hamilton and that of his wife Mary was 3478 East 105th. He died of chronic nephritis and old tuberoles of the lungs; a contributory cause of death was insanity due to alcoholism. James and his wife, who died December 17, 1944, are both buried in Calvary Cemetery. James Colgan's story has been rather a hard story to tell. I debated whether to write it up at all. I came across him on a census record and, because of his surname, thought he might be from Kilkeel, the same area as my grandparents. He isn't a relative, but he is somebody's relative and someone somewhere is probably wondering what happened to him after he left Ireland. I hope this helps them find him.